The Webscaper, LLC is a boutique web development company specializing in developing custom designed WordPress websites for small- to mid-sized businesses and organizations. Under the creative direction of founder Kym Costanzo, the Webscaper offers a full range of website marketing services including website design, maintenance, support, SEO services, e-mail marketing, social media development, and much more. Based in northern Chester County, Pennsylvania, we serve clients in the suburban Philadelphia region as well as nationwide. As the owner of a small business without a large marketing or IT department (or budget! ), the task of creating and managing your website likely falls on your shoulders. You know that you need a website to compete, but you just don’t have the time to figure all this web stuff out yourself. The Webscaper caters to clients just like you. We explain the entire process to you in plain English. From finding a web host and choosing a domain name to understanding SEO and promoting your website, we are with you every step of the way. Unlike other web design firms who offer one-size-fits-all website packages, we recognize that every business’s needs are different. Some businesses are looking for extensive website functionality or are ready to launch significant social media campaigns. Other businesses are just starting out and aren’t really sure what the best way to reach their audience is. We custom tailor a website plan with each and every client, taking the time to explain every option and make helpful recommendations. We take into consideration your budget, the amount of time you have to devote to your internet marketing plan, your target audience and your website goals. Once your website is built, you’re not left on your own. We are more than just a designer – we are your internet marketing partner. We remain available to our clients for everything from consultation and training to support and maintenance. Whether you need occasional recommendations, or someone to completely manage all of your website updates and content – we have a support and maintenance option for you. Even if you’re not sure that you’re ready to commit to a website design or maintenance plan, contact us. You’ve got questions and we can help advise you on the best plan of action. Choosing a web developer can feel like an intimidating prospect, but it won’t be with the Webscaper. 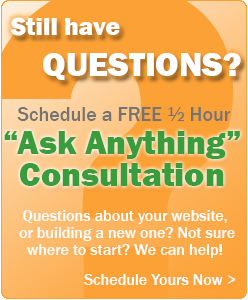 Take advantage of our free half-hour “ask anything” consultation. Even if you intend to scope out other designers (which we encourage! ), let us answer your initial questions that can help you in your search. Request your consultation today – you will be glad you did! I love it! Great job, thank you very much for continuing to work with us to get the website we need to support our growth. You demonstrated your usual commitment to excellence and genuine desire to do great work for your clients. The Webscaper goes the extra mile by finding your business’ greatest asset and forming it into a creative, interactive and informative tool. Clearly the best investment for my business! Silvana M. StammOwnerOur Place to Grow, Inc. Proudly serving clients locally in the suburban Philadelphia region as well as across the United States.